The current Madison County Courthouse was built in 1970. It is at least the fifth courthouse to serve Madison County. According to the U.S. Census Bureau, the county has a total area of 472 square miles (1,220 km2), of which 466 square miles (1,210 km2) is land and 6.4 square miles (17 km2) (1.3%) is covered by water. The county has three natural borders: its eastern boundary is defined by the Trinity River, its western boundary is defined by the Navasota River, and the portion of its southern border adjacent to Walker County is defined by Bedias Creek. As of the census of 2000, there were 12,940 people, 3,914 households, and 2,837 families residing in the county. The population density was 28 people per square mile (11/km²). There were 4,797 housing units at an average density of 10 per square mile (4/km²). The racial makeup of the county was 66.79% White, 22.87% African American, 0.32% Native American, 0.39% Asian, 0.03% Pacific Islander, 7.90% from other races, and 1.72% from two or more races. 15.78% of the population were Hispanic or Latino of any race. There were 3,914 households out of which 31.50% had children under the age of 18 living with them, 57.10% were married couples living together, 11.70% had a female householder with no husband present, and 27.50% were non-families. 24.50% of all households were made up of individuals and 12.40% had someone living alone who was 65 years of age or older. The average household size was 2.57 and the average family size was 3.05. In the county, the population was spread out with 21.10% under the age of 18, 13.00% from 18 to 24, 31.90% from 25 to 44, 20.00% from 45 to 64, and 14.00% who were 65 years of age or older. The median age was 33 years. For every 100 females there were 142.60 males. For every 100 females age 18 and over, there were 155.10 males. The median income for a household in the county was $29,418, and the median income for a family was $35,779. Males had a median income of $25,625 versus $19,777 for females. The per capita income for the county was $14,056. About 12.30% of families and 15.80% of the population were below the poverty line, including 20.00% of those under age 18 and 16.30% of those age 65 or over. The Ferguson Unit, a Texas Department of Criminal Justice prison for men, is located in an unincorporated area in the county. ^ Hodges, Ann E. "Madison County". Texas State Historical Association. Retrieved 12 April 2014. 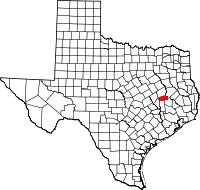 ^ Madison County from the Handbook of Texas Online. By Ann E. Hodges. Retrieved 5 February 2007. ^ "Ferguson Unit Archived 2010-07-25 at the Wayback Machine." Texas Department of Criminal Justice. Retrieved on July 16, 2010.